We all use all sorts of USB devices on our PCs, but sometimes USB devices can be a security risk. USB flash drives and other storage devices can be infected with viruses, but you can easily protect your PC from USB threats. There are tools that can help you manage your USB devices, and today we’re going to show you the best USB control software for Windows 10. What is the best USB control software for your PC? If you’re a home user and you’re looking for an application that can help you prevent data theft, you should consider this app. Using this tool you can prevent storage devices from running on your PC and prevent any chance of malware infection via USB. In addition, you can prevent writing to removable storage and prevent file copying without your permission. It’s worth mentioning that this tool also works with multimedia devices such as Android and iOS devices. Besides removable storage, you can also prevent reading and burning of optical media right from this app. The software allows you to create a list of trusted devices meaning you’ll be able to use the devices you trust without any restrictions. In addition to USB devices, the application also has a website lock feature. If needed, you can also stop users from changing IP address or disable the network adapter completely. The tool also has a program lock feature and you can use it to prevent users from running certain applications. You can block any third-party application or system applications such as Registry Editor and Task Manager. The application can also block other devices such as printers, modems, COM & LPT devices, infrared and Bluetooth devices. USB Lock has password protection so users won’t be able to tamper with your security policies. There’s also email notification available, so you’ll know if someone tries to access the application with a wrong password. This tool has a solid reporting feature so you can keep a close eye on all file operations. In addition, you can also see all removable storage that was connected to your PC along with the list of allowed and denied access attempts. Gilisoft USB Lock has a simple to use interface but it offers advanced features. The application allows you to set a list of trusted devices, so you won’t have to worry about data loss or malware infection ever again. The software is available for a trial, but you’ll need to get a license to continue using it. Note: If you find Gilisoft USB Encryptor, do not confuse it with USB Lock. USB Encryptor is another powerful protection tool against any threats, but it uses different algorithms. However, it is up to you to choose the right tool in order to increase your USB protection. If you’re a computer administrator and you manage multiple PCs in your network, you might be interested in this application. Using this tool you can automatically install patches on all computers in your network. This feature works with Adobe Acrobat, Firefox, Java and other third-party apps. If needed, you can also choose which applications you want to update. In case there’s a problematic patch available, you can choose not to install it. In addition to patches, this application is perfect if you need to install certain software on all computers in your network. The installation doesn’t require any user interaction, and you can schedule the installation time, set the parameters and completely automate the process. As for supported formats, you can easily install MSI and EXE applications using this feature. Desktop Central also supports remote control allowing you to take control over any PC in your network. Remote control is web-based so you can use it from any PC. If needed, you can lock user’s keyboard and mouse in order to stop them from interfering. If you’re working with sensitive information, you can also turn off user’s screen so he can’t see the changes you’re performing. During the remote session you can use Ctrl + Alt + Delete and Alt + Tab commands and transfer files remotely. Of course, 128-bit Advanced Encryption Standard (AES) is available, so your remote sessions will be completely private. The tool also supports power management so you can easily keep track of power consumption. The tool supports predefined power templates, but you can also remotely turn off screen savers, monitors, hard drives or completely turn off the computer. Using this tool you can also control the USB devices connected to the computers in your network. The application offers granular control, but it also allows you to enable or disable specific devices. You can also restrict USB usage for all users or all computers in the network to enhance your security. The application works with nine different types of USB devices, so you can easily control them remotely. The application also has predefined configurations that you can apply to specific computers in your network. If you want to enhance computer performance in your network, you can use many built-in tools such as Disk Defragmenter, Check Disk and Clean Disk. If needed, you can schedule these tools to run automatically ensuring maximum performance from all PCs in your network. Desktop Central is a solid application if you need to configure all PCs in your network. In addition to computer configuration, you can also control USB devices and protect all network computers. This is a great application, but it’s aimed towards network administrators and advanced users. If you’re just a basic user that wants to control USB devices, you might want to skip this software. Another application that can help you control USB devices and protect your PC from data theft or malware is Device Control. If you have sensitive information on your PC, you might want to protect them from unauthorized access with this application. With this tool you can easily monitor, control or completely block USB storage devices. If needed, you can also block the actual USB port so it won’t work with any USB device. After you define your device policy, you can easily monitor all ports and devices on your remote computers. If needed, you can block devices or enforce encryption in order to protect your files. In case any security policy is violated, you’ll get an instant report via email. The application allows USB port monitoring and lockdown for all major desktop platforms. It’s important to mention that this service has a web-based interface so you can easily monitor USB ports from any device. In addition, the service is simple to setup, and you can have it up and running in a matter of minutes. The application offers precise control and you can specify which devices can or can’t be used. In addition, you can create device whitelist or define user rights for each user or group on the PC. If needed, you can grant USB access remotely even if the computers are offline. Of course, you’ll get a detailed report about USB usage once you connect back to the network. Device Control is a solid USB control application, and it’s perfect for network administrators. If you want to try this application out, feel free to request a demo from the developer’s website. 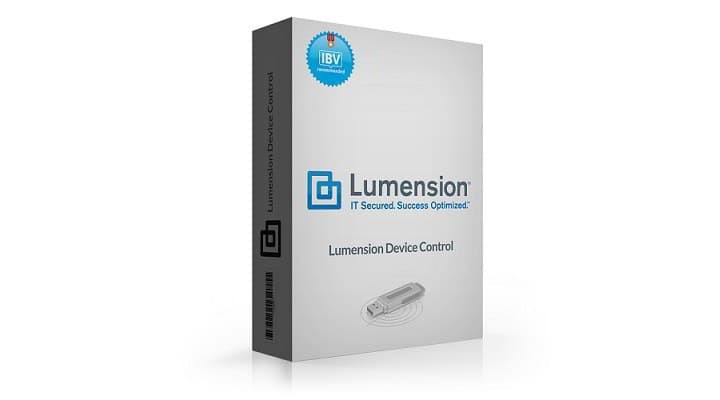 Another great tool for network administrators that can protect your PC from data theft is Lumension Device Control. Using this application you can set security policies for removable storage and optical discs. The application allows you to see which user is using removable storage so you can easily monitor all endpoints in your network. In addition, you can easily see which endpoints have a removable storage connected to them. There’s also a detailed log so you can see all allowed or blocked events, policies by devices, machine or user and all file metadata. Thanks to this feature you’ll be sure that nobody is installing any malicious applications or copying files without a permission. If needed, you can also change permissions for USB devices and allow users temporary access. Speaking of access control, you can also completely block all USB storage devices from running on endpoint computers. To enhance the security, you can prevent reading or writing from USB devices and set enforced encryption. Speaking of encryption, the application uses FIPS 140-2 technology to protect your data. This is a rather useful feature because you can force all users to encrypt their data before transferring it to a removable storage. As a result, all transferred data will remain protected even if the removable storage is lost or stolen. If needed, you can set data limit for file transfer ensuring that users can’t copy large files to removable storage. As a result, you can minimize the damaged caused by data theft. Of course, you can see the list of all files that are written or read from the removable storage or optical drives. Thanks to this feature you’ll always know what type of files are your users copying or running from removable storage. To protect your network from malware, you can also set the list of trusted devices in order to minimize the chance of malware infection. If needed, you can also set the type of files that can be transfer from and to the removable storage. Lumension Device Control is a great application that allows you to have full control over all USB ports and devices in your network. This is a powerful tool for network and system administrators, and if you want to try it out you can download the free trial version. USB storage devices are useful, but they can be a security risk in your network. If you own a business, it’s important to protect your data and prevent any chance for data theft. Using this tool you can easily monitor and control data transfers on all PCs in your network. The application offers enhanced control management system that allows you to prevent copying of classified data. You can control all USB devices based on their product and vendor ID, serial number, device class, and device name. Using these parameters you can allow data transfer only for specific USB devices that you trust. McAfee Device Control can completely block removable storage devices or force them to work in read-only mode. By doing so, you’ll eliminate the chance of data theft in your network. The application also offers content-aware protection for removable devices, and there’s full integration with McAfee Endpoint Encryption available. In order to protect your files, the application offers file access protection for removable storage. Thanks to this feature, your files will remain protected even if the removable storage is lost or stolen. If needed, you can also block copying of specific files and eliminate the chance for data theft. There’s also a Citrix device rule that can block access to local drives, removable storage, printers, optical drives, clipboard, etc. The application can also block read-only files and provide you with detailed information regarding user activity. Speaking of user monitoring, the application works with McAfee ePolicy Orchestrator allowing you to keep track of events in real-time. With this tool you can see information such as used data, sender, recipient, timestamp and data evidence. Thanks to this feature you’ll be sure to find about data theft as soon as it occurs. McAfee Device Control is a great application and it will help you control all USB devices in your network. The application is designed for system and network administrators, so if you want to enhance the security in your network, you might want to consider using this tool. Another great application that can help you monitor your files and control USB devices is PA File Sight. Using this tool you can keep a close eye on all your files and see who’s using them. In addition, you can see when a specific file was created, renamed, moved or deleted. In fact, you can also find which user deleted a file and from which device. Using this tool you can monitor all files or specific files and see even the slightest file changes. In fact, you can also see permission changes as well as both successful and failed actions. To keep an absolute control over the files in your network there’s a real-time monitoring feature that allows you to see changes as soon as they occur. The application also supports different types of notifications, so you can receive an email or SMS message when a security violation occurs. In addition, there’s support for an SNPP pager, but you can also run any application once the security violation occurs. Of course, all security violations will be recorded in a log file, so you can see detailed information about any infractions. The application supports remote monitoring so you can easily monitor remote servers with ease. Speaking of which, there’s also a Remote Desktop feature available so you can take control over the remote server and fix any potential issues. It’s worth mentioning that PA File Sight supports USB control so you can prevent USB devices such as flash drives from running on your PC. The application also works with optical drives, and you can automatically eject them once they are inserted. Of course, you can also automatically disconnect storage devices as soon as they are added or disable AutoRun for drives and optical discs. There’s also support for trusted devices, and to register a trusted device you just have to add its serial number to the list of exceptions. We also have to mention that this tool supports action URLs, so you can open a specific URL with desired parameters once an infraction occurs. There’s also a Desktop Notifier feature that will show you alerts in the system tray. The application also offers additional types of actions so you’ll never miss an important alert. PA File Sight is a great file monitoring tool, and it’s perfect for network and system administrators. There are two versions available, Lite and Ultra, and both of them offer different features. Both versions are available for a 30-day trial, so feel free to try them out. If you’re looking for a USB control software, you might be interested in MyUSBOnly. The application allows you to create a list of trusted USB storage devices so you can rest assured that nobody will be able to copy files from your PC. MyUSBOnly logs all USB activity so you can easily see when removable storage was connected or disconnected from your PC. In addition, you can also see all copied, modified and deleted files. You can also set up email notifications and receive an email if an unauthorized storage device is connected to your PC. The application is lightweight and almost invisible so users won’t even know that it’s running in the background. MyUSBOnly is perfect for home users that want to protect their data, but it’s also suitable for business users. The application can keep track of your network PCs and workstations, so it’s perfect for network administrators. It’s worth mentioning that this application requires a password, so users without the password can’t disable it or uninstall it. MyUSBOnly is rather simple to use, and with its friendly user interface even the basic users will be able to protect their PC from data theft. It’s worth mentioning that this device can block removable storage devices, but it can also disable optical drives and various smart devices. It can also prevent USB Wi-Fi adapters or Bluetooth devices from working. As a result, the chance for data theft using USB devices is almost nonexistent. There’s also a cloud version that allows you to monitor all your computers remotely. In addition, you can also remotely authorize devices for all your computers. MyUSBOnly is a decent application, and unlike previous entries on our list, it’s simple enough so even the home users can use it without any problems. If you need to protect multiple computers, there’s also a special version optimized for businesses. The application is available for a free trial, but if you want to continue using it, you need to purchase a license or pay a yearly subscription. If you’re looking for a simple application to control USB devices on your home PC, you might want to check USB Manager. The application has a humble user interface and it allows you to block different types of USB devices. For example, you can easily block storage devices, printers, audio devices or scanners. To do that, simply select the device you want to block and you’re good to go. As you can see, the application is incredibly simple to use, and even the most basic users will be able to use it. Unfortunately, there’s no support for trusted devices, so you can’t configure which devices can be used on your PC. As a result, if you choose to block removable storage, all removable storage devices will be blocked from running on your PC. This can be a problem especially if you want to block all storage devices except your own. The application supports password protection so you can easily secure it with a password. By doing so you’ll prevent unauthorized users from changing your settings and unblocking USB devices. USB Manager also supports hotkeys and you can start the application by using the predefined keyboard shortcut. It’s worth mentioning that you can set this application to start automatically with Windows, but you can also hide it from other users. By doing so other users won’t even know that this tool is running in the background. 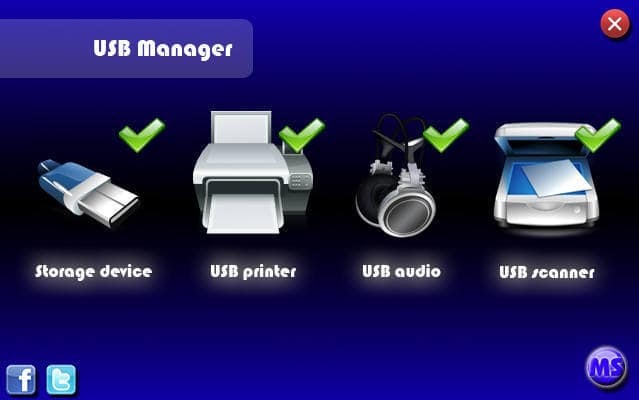 USB Manager is incredibly simple to use which makes it perfect for basic home users. As for flaws, some users might not like the humble user interface and the lack of support for trusted devices. Despite some flaws, this is still a decent USB control software, and if you’re looking for a free and simple application you might want to try USB Manager. Another USB control software for home users is Windows USB Blocker. This is a freeware and portable application, so you can run it on any PC without an installation. The application is incredibly simple to use, and it will block all removable storage on your PC. To block all USB flash drives you just need to click a single button. After doing that, you won’t be able to access any removable storage from your PC. The application has a simple user interface so even the most basic users will be able to use it. Unfortunately, the application doesn’t offer any advanced options so you can’t set a list of trusted devices. As a result, you can only block or unblock all removable storage devices from running on your PC. We also have to mention that this tool doesn’t support other types of USB devices, so printers, Bluetooth dongles and other USB devices won’t be blocked. The latest version also has support for command line interface which can be useful for advanced users that want to automatically block USB devices. 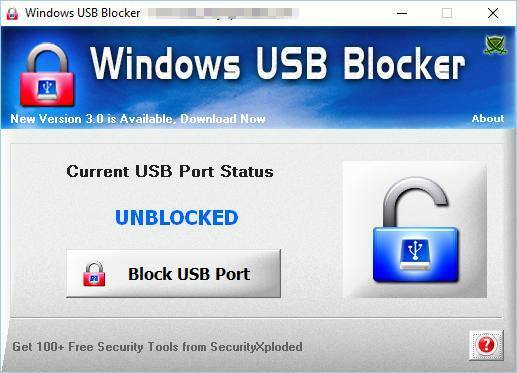 Windows USB Blocker is incredibly simple to use, but it doesn’t offer any advanced features. 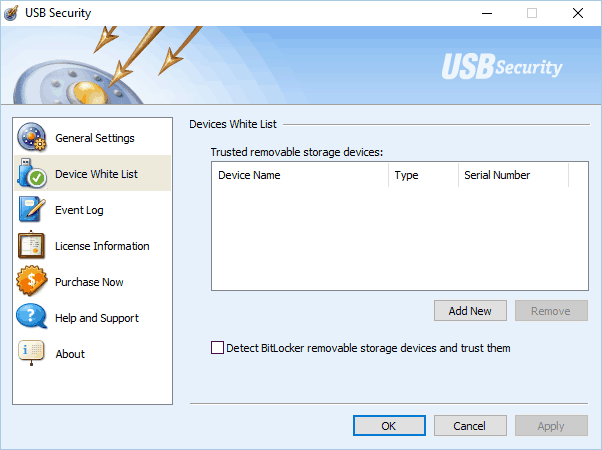 If you’re a home user and you need a free and portable application to block USB devices, you might want to consider Windows USB Blocker. If you want to protect your home PC from data theft and malicious files, you might want to consider USB Disabler. This is a lightweight application that can prevent USB flash drives from running on your PC. Using this tool you can set all USB flash drives to work in read-only mode. In this mode users can run applications and files from the USB flash drives but they can’t copy any files to them. Using this feature you can easily prevent data theft and be sure that nobody isn’t copying your files without your permission. If you want more protection, you can completely disable USB drives from running on your PC. By doing so, users won’t be able to open any files or copy them to the removable storage. In fact, they won’t be able to access removable storage at all. This option is perfect if you’re concerned that someone might infect your PC by connecting a malicious USB flash drive to it. If you want to connect a trusted USB flash drive, you can do so by turning on the normal mode. This will allow you to access and copy files to your flash drive without any restrictions. The application is incredibly simple to use and it can block and unblock USB flash drives simply by choosing the desired option from the dropdown menu. We have to mention that this application requires administrator privileges in order to work, so be sure to run it as an administrator. USB Disabler is simple to use, but it doesn’t offer any advanced features. Our only complaint is the lack of ability to set trusted devices, meaning that you can disable or enable all USB storage devices using this app. On the other hand, the application is completely free and portable, so it’s perfect for any home user that wants to protect its PC. If you’re concerned that someone can steal your data or infect your PC by using a removable storage device, you should definitely consider using USB Block. The application has a simple to use interface that allows you to easily block USB devices. Using this tool you can block removable storage as well as optical discs and floppy drives. In addition, you can also block network access and non-system drives with this tool. The application allows you to set the list of authorized devices so you can block all devices except your own USB flash drive. To protect your data from unauthorized access, the application will ask you to set a password. After doing that, if unknown device is detected you’ll be asked to enter your password in order to authorize it. If you want, you can add the device to list of exceptions so you can connect it without any prompts. Since the application is protected by a password, unauthorized users won’t be able to open it and change your settings. It’s worth mentioning that the application has a built-in log so you can see if anyone tries to access the application or authorize an unknown device. Another useful feature is the ability to run this tool in Stealth mode. By doing so, the application will be hidden from Start Menu, Desktop and Control Panel. If needed, you can also set a keyboard shortcut to activate the Stealth mode with ease. Another great feature is the ability to run this application in Safe Mode, so even the most persistent users won’t be able to bypass it. USB Block is simple to use, so it’s perfect for home users that want extra security. The application allows you to set the list of trusted devices, which is also a major plus. 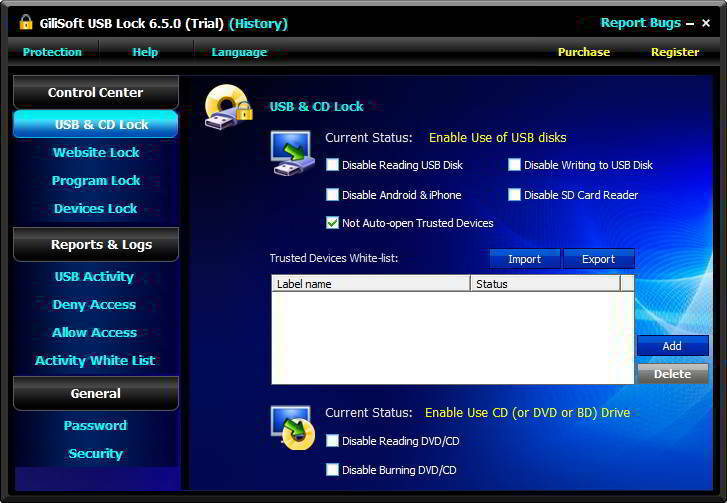 USB Block is available for a free trial, but if you want to continue using it you’ll need to purchase a license. 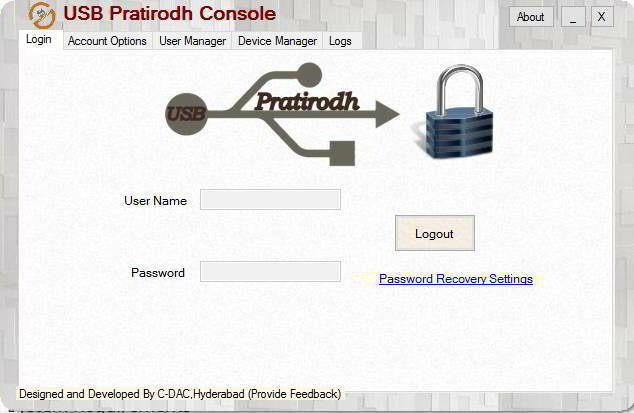 Another application that will allow you to protect your PC from data theft and malware is USB Pratirodh. Using this tool you can easily prevent removable storage from being used on your PC. The application will block all USB storage devices, and if you want to use a specific device you need to register it beforehand. You can configure each registered device and allow the removable storage to run only in read-only mode. By doing that, users won’t be able to copy any data to the USB drive. If needed, you can also enable full access to the USB drive. This is useful if you want to connect your own flash drive and freely copy your files. According to the developer, the application also supports encryption and malware detection. USB Pratirodh has a humble interface that some users might not like. The application is relatively simple to use, but not as simple as other entries on our list. To add a trusted device, first you need to create your username, protect it with password and assign a new device to it. This method offers extra protection, but the entire process might be a bit confusing to new users. We also have to mention that the application has a master password that will prevent other users from changing your security settings. Overall, USB Pratirodh is a decent tool that offers some advanced features. The application is completely free, and if you don’t mind the slightly outdated interface feel free to try it out. Protecting your PC from data theft isn’t hard, and if you want to do that we suggest you try this tool. PhrozenSoft Safe USB is a small tool that allows you to easily disable all USB storage devices. By doing so you won’t be able to access any USB storage device on your PC. This is useful if you think that someone might infect your PC by using an infected USB flash drive on it. If you’re concerned about data theft, you can use read-only mode to prevent users from copying your files to removable storage. Of course, you can also disable all protection and allow all USB devices to work on your PC without any restrictions. PhrozenSoft Safe USB is an incredibly simple application and it allows you to block all USB removable storage from working on your PC. If needed, you can also set the application to start automatically every time with Windows. Newer versions of the tool also offer password protection and ability to disable Auto Play for all USB flash drives. The application is rather simple to use, but we have to mention that you can’t set trusted devices. This means you can only block all USB storage devices without exceptions. In our opinion this is a big flaw because you don’t have any advanced control over your devices. PhrozenSoft Safe USB is simple and lightweight so even the most basic home users will be able to handle it. The application is rather basic and it doesn’t offer any advanced features. Nevertheless, if you want a simple and free application that can control your USB devices, be sure to consider PhrozenSoft Safe USB. Another lightweight application that can stop data theft and protect you from malware is USB Flash Drives Control. This is a freeware application and it will run from the system tray. Using this tool you can see the connected USB flash drives, and you can even explore them right from the application. USB Flash Drives Control allows you to control all USB flash drives by unchecking certain privileges. 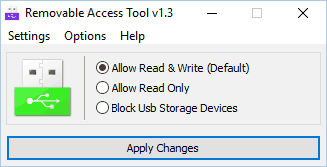 There are three options available and by turning off the read mode you won’t be able to write any files on the USB flash drive as long as it’s connected to your PC. In fact, you won’t be able to see or access your flash drive at all. This option is useful if you’re worried that someone might use an infected USB flash drive on your PC without your knowledge. There’s also a write mode available, and by turning it off you won’t be able to write any files to your USB flash drive. Thanks to this feature, you’ll successfully prevent any chance for data theft. 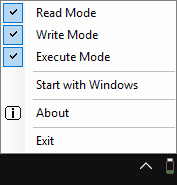 Another option is Execute Mode, and by turning this option off users won’t be able to run executable files from USB flash drive. This feature is rather useful if you don’t want users to run unknown and potentially malicious applications from the flash drive. Keep in mind that these options don’t apply to already connected devices. USB Flash Drives Control is a lightweight and simplistic application and with minimalistic user interface even the basic users will be able to protect their PC. As for the flaws, the application doesn’t allow you to set a list of trusted devices, and that’s our only complaint. Despite this flaw, this is still a solid application so feel free to try it out. If you want to protect your PC or multiple PCs in your network, you might want to consider using AccessPatrol. The application allows you to control various USB storage devices such as flash drives, multimedia devices, Bluetooth and WiFi adapters. Using this tool you can set three different security levels, including full access, read-only access and no access at all. Thanks to these options, you can easily limit the access or completely block certain devices from running on your PCs. The application has a centralized web console, so you can enforce your security policies on all PCs in your network. Using this tool you can have detailed device reports, and you can also set the list of trusted devices. By doing so you can set the list of authorized devices and give them the full access to PCs in your network. In fact, you can also authorize specific devices only for certain users and enhance your security even further. Since this tool is designed for network administrators, you can remotely install it and secure your entire network in a matter of minutes. AccessPatrol supports email reports so you can easily get a detailed report about device usage in your network. Thanks to this feature, you can easily find any security violation with ease. Another useful feature is the ability to protect your devices and sensitive information even outside your network. There’s also a scheduling feature so you can allow unrestricted access to USB devices only during specific time of the day. AccessPatrol is a great tool that can help you control USB devices in your network. The application offers a wide array of features, and with support for remote monitoring it’s perfect for system administrators. You can download the application for a 14-day trial, but if you want to continue using it you’ll need to purchase a license. 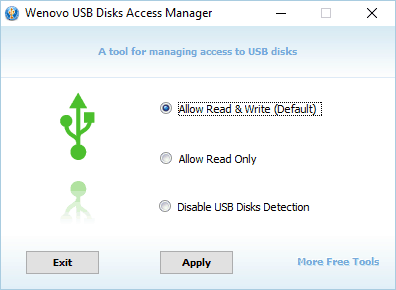 Another freeware application that can help you protect your PC from file theft and malware is Wenovo USB Disks Access Manager. This is an incredibly simple application, so even the most basic users will be able to use it. The application has only three options and it allows you to enable all USB storage devices, run them in read-only mode, or completely block the detection of USB devices. By using read-only mode you’ll prevent users from copying files to their removable storage and successfully prevent data theft. If you’re worried that someone can connect an infected USB flash drive to your PC, you might want to consider disabling USB disk detection completely. By doing so, your PC won’t recognize removable storage and it won’t be able to use it at all. As previously mentioned, this application is incredibly simple to use, but it doesn’t allow you to set a list of trusted devices. With the lack of this feature you can only block or unblock all USB storage devices from running on your PC. Wenovo USB Disks Access Manager is a freeware and completely portable application, so it can run on almost any PC without issues. The application is perfect for home users, so if you want to protect your personal PC, be sure to download and try this application. Another application that can help you secure your data from data theft is DriveLock. This application allows you to take full control over all removable storage and prevent data theft. Using this tool you can control the data flow and monitor your files at all times. There’s support for remote access, and it addition to removable storage you can also prevent optical discs from running or burning. The tool also allows you to choose which applications are allowed to install. By doing so, you can prevent the installation of unwanted applications and be sure that your personal network is safe from malware. You can set a list of trusted applications and prevent all other untrusted apps from running. DriveLock offers a powerful reporting system that allows you to keep a close eye on all used storage devices. Thanks to this feature you can see all transferred data and be sure that no data theft occurs. If needed, you can print your reports or export them to Excel, PDF and HTML format. You can also get scheduled reports via email and be sure that no infractions occur. There’s also support for encryption which means that you can protect all files that are stored on the removable storage. Thanks to this feature, all your files will remain protected even if the removable storage is lost. DriveLock is a great application for USB control, and it’s perfect for system administrators that need to control multiple PCs in the network. The application is available for a free trial, but if you want to continue using it, you’ll need to obtain a license. Another simple and free application that can protect you from data theft and malware is BuduLock. This application is simple to use, and it allows you to completely disable USB storage devices from working on your PC. The application doesn’t offer a read-only mode, so you can only enable or disable USB storage devices. It’s also worth mentioning that this tool doesn’t support trusted devices, so by using it you’ll prevent all USB storage devices from working on your PC. In order to block USB devices, you need to disable User Account Control beforehand. The application also allows you to set a password and prevent unauthorized users from unlocking USB devices. In addition to USB devices, the application can also work with folders, and you can easily lock any folder with a single click. This feature is useful if you’re concerned that someone might access or steal your important files. 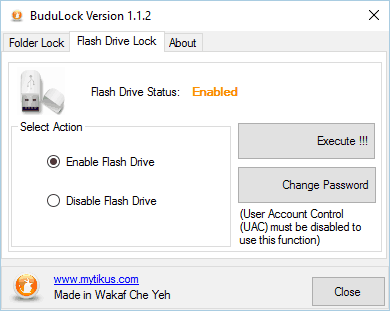 BuduLock is a simple application and it can easily enable or disable USB storage devices from running on your PC. Unfortunately, there’s no ability to set trusted devices and you can’t use removable storage in read-only mode. On the bright side, the application is completely free, and it also offers folder locking feature, so you might want to try it out. If you want to protect your home PC from data theft, you should consider using this simple tool. The application is quite simple, and you can easily enable or disable USB storage devices from working on your PC. Unfortunately, the application doesn’t allow you to set up trusted devices. However, you can set removable storage to work in read-only mode and prevent users from copying files to it. By doing so, you’ll prevent all chances of data theft. If you’re concerned that someone might run a malicious application on your PC, you can easily disable all USB devices from running. 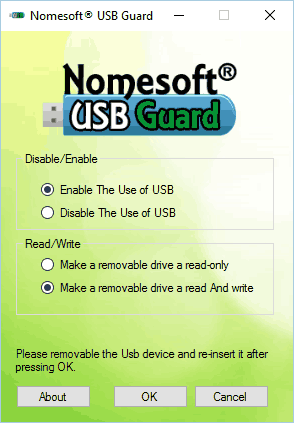 Nomesoft USB Guard is incredibly simple to use, but it doesn’t offer any advanced features. On the other hand, this application is completely free, so it’s perfect for home users. The application lacks password protection which can be a security concern for some users. Despite some flaws, this is a decent application so be sure to consider it. Another free and portable application that can help you control USB devices is Ratool. The application has a simple user interface that allows you to block all removable storage from running. In addition, you can also force removable storage to run in read-only mode and prevent any chance of data loss. The application also allows you to set a password and prevent unauthorized users from changing your security settings. In addition to USB removable storage, you can also block optical drives, floppy drives, tape devices and WPD devices from running. Many infected USB devices will automatically run malware once you connect them to your PC, but this tool allows you to disable Autorun feature for removable devices. By doing so, you can prevent most malware from infecting your PC. You can also force hidden files to be displayed on the flash drives. Thanks to this feature, you can easily detect any suspicious and potentially dangerous files. The tool can also prevent the installation of new USB devices which is useful if you want to disable all unknown storage devices from working on your PC. Overall, Ratool is a solid application, and it offers all the basic features that a home user needs. In addition, you can also prevent all unknown USB devices from running on your PC. The application is completely free and portable, so feel free to try it out. Another great tool for system administrators that allows you to control USB devices is DeviceLock. The application comes with device access control feature so you can control which users have access to USB devices. For example, you can control which users can access removable storage, FireWire, Infrared, COM and LPT ports. In addition, you can restrict access to WiFi and Bluetooth adapters. The application can also control MTP devices such as smartphones, tablets and all sorts of media players. Lastly, you can restrict access to optical media and floppy drives as well. It’s worth mentioning that you can set devices to run in read-only mode so users in your network won’t be able to copy any files to them. Application also offers network communications control, so you can easily monitor network protocols, web applications and instant messenging apps. The application can easily monitor network activity in your network, but you can set a list of trusted services, websites and email addresses that you can access. DeviceLock also has Content Filtering feature so you can see all data that is copied to removable storage, clipboard or sent to printer. Speaking of which, the application has character recognition feature available so you can easily inspect textual data from pictures and graphical files. It’s worth mentioning that this tool has a Tamper Protection that prevents users from changing security policies. Even users that have system administrator privileges won’t be able to configure DeviceLock. To make any changes to the security policies, users have to access DeviceLock console with a proper password. The application supports centralized configuration and deployment meaning that you can deploy security policies to computers in your network with ease. There’s a file type control feature that supports over 5300 different file types. The application will analyze the file’s binary content and determine its true type before enforcing the security policy. It’s worth mentioning that you can set up different file policies for users and groups in your network. By doing so, you’ll be sure that users can’t copy or access specific file types in your network. Another great feature is clipboard control, and thanks to it you’ll be sure that users in your network can’t transfer sensitive information. The application lets you have control over the type of files that users can access from clipboard. In addition, you can easily monitor the content of the textual data copied to the clipboard at any time. The application can prevent users from creating screenshots, but it also allows you to see the list of created screenshots with ease. There’s support for trusted devices, and you can easily add a specific device to the list of trusted devices. As for white listing, you can add the device to the list by using its serial number. White list feature also works with optical media, so you can easily allow certain optical discs to run in your network. There’s also support for temporary access by using access codes. In addition, the software also allows you to add specific protocols to the white list. The application offers detailed reports, so you can easily view any security violations that occurred in your network. There’s also SNMP, SYSLOG and SMTP alerting so you’ll get a notification as soon as a security violation occurs. There’s also support for file shadowing as well as forced encryption for all removable storage devices. DeviceLock offers a wide array of features, so it’s perfect for network and system administrators. As for availability, you can download the trial version for free, but in order to continue using this tool you need to obtain a license. Another application for network and system administrators that can protect all PCs in your network is GFI EndPointSecurity. This application is perfect if you’re concerned about data theft in your network. The software can force file encryption for all removable storage meaning that your files will remain protected at all times. The application has automatic computer discovery feature that allows you to easily detect any new PCs in the network. Thanks to this feature, the administrator can see any new PC that is connected to the network and automatically apply security policies to it. The application supports scheduling and you can set auto detection to run at predefined intervals ensuring that all new PCs are discovered as soon as possible. GFI EndPointSecurity also has device reporting feature so you can see graphical reports about all devices in your network. In addition, you can also view information regarding user activity, copied files, etc. There are multiple types of reports available, so you can easily see all the necessary information. Application supports grouped protection so you can easily group computers and apply security policies to them. Each group can have different policies and different portable device access assigned to them. The application supports real-time monitoring so you can easily see user statistics in real-time. In addition, you can receive alerts as email, SMS or network messages as soon as a specific device connects to your network. The software also offers device-related user activity logs allowing you to see the list of files accessed on any device. GFI EndPointSecurity also supports blacklists so you can allow or deny access to specific devices. In addition, you can set different access policies for different users and groups. By doing so, you can grant specific users different access rights to certain devices and allow only company-approved devices to be used in your network. GFI EndPointSecurity is a great tool that can protect your network from data loss or malware. This is an advanced application, so it’s perfect for system administrators and other advanced users. The application is available for a free trial, but if you want to continue using it, you’ll need to purchase a license. Another application that can help you protect your data from data theft is DigitalGuardian. As for protection, the application protects your files by assigning certain tags to them. If a user tries to send a tagged file, the file transmission process will be stopped. In addition to blocking, the application can also create detailed logs so you can see information about every policy violation in your network. The application also supports file encryption and you can automatically block, justify or encrypt sensitive data. This feature works for email attachments, files moved to removable drive or cloud storage. In addition to encryption, you can also set the type of files that can be transferred to removable devices. If needed, you can also set a fixed amount of data that each user can transfer in specified time period. By doing so, users will be able to transfer only a limited amount of data. If you need extra security, you can easily create a blacklist of devices based on their serial number. DigitalGuardian is a professional tool, so it’s perfect for system administrators and business environments. The tool is available for a free trial, but you need a license if you plan to continue using it. Data theft can be a big problem, but if you want to protect all computers in your network, you might want to consider using this tool. By using this tool you’ll prevent data leaks in your network along with malware infections. In addition, you can completely restrict access to USB ports and ensure that data doesn’t leave your network without your knowledge. The application uses endpoint USB security technology that allows you to monitor usage of USB devices. This feature supports removable storage, phones, cameras and wireless network devices. The application allows you to set response rules so you can disable USB devices once a security breach occurs. In addition, you can set a list of trusted devices and apply a specific set of rules if an unknown device is connected to your network. For example, you can automatically detach USB devices, terminate processes, block IP addresses or turn off your PC. The application also supports detailed reports, so you’ll be able to keep a close eye on all computers in your network. Solarwinds USB Analyzer is a great tool and it offers an abundance of features. This application is designed for advanced users and system administrators, so it might be perfect for your business network. Free trial version is available, but in order to continue using this tool you need to purchase a license. If you’re a system administrator and you’re looking for a USB control software, you might want to consider this tool. Safend Protector can protect you from data theft by monitoring all endpoint devices and data flow in your network. The tool can restrict file access, but it can also encrypt media devices. The application offers detailed analysis and reporting features and it complies with the latest standards. In addition to data theft, the tool can also protect you from malware. The application will automatically scan each USB device for viruses. If the device is clean, you can allow it to access your network. If you want to enhance your security, you’ll be pleased to hear that this software offers device detection and restriction so you can easily block certain devices from accessing your network. You can block devices by type, model or by their serial number. This tool also supports encryption so you can easily encrypt files on removable storage and optical discs. By doing so, your files will remain protected even if the removable storage is lost. In addition to USB control, the application offers granular Wi-Fi control according to MAC address, SSID or network security level. If needed, you can also block hybrid network connections and enhance your security even further. There’s support for 3rd party antivirus tools allowing you to use them to scan removable storage with ease. The application also offers extensive reporting so you can easily find out every data leak. Speaking of which, you can receive periodic reports and keep up with user’s activity in your network. The application will report all intentional and unintentional security events as well as suspicious activities. In addition, you can also see detailed reports about device usage in your network. There’s also an auditing feature that allows you to keep a constant track of your endpoints. The tool will show you all information regarding USB, FireWire, PCMCIA, PCI, internal storage and Wi-Fi connections. Safend suite is a powerful tool that will help you control USB devices and prevent any chance for data theft. The application is perfect for network and system administrators, and it’s available for a free trial. Data leak can be a big problem, but you can easily protect all devices in your network by using this tool. The software allows you to encrypt data stored on removable devices, but you can also track and manage removable devices individually. In addition to USB devices, the application offers encryption for optical discs as well. The tool also has removable media enforcement that maximizes data security by assigning a digital signature on each encrypted device. By doing so, the user will be informed if any change to stored data occurs. The tool also has device access control settings so you can easily control removable media, FireWire, Bluetooth, Wi-Fi and other devices. The application offers advanced control and you can set different policies for devices by brand, type, size or ID for maximum security. The tool also supports logging and alerts allowing administrators to keep a close eye on users. If needed, you can also receive email alerts as administrator as soon as a security violation occurs. Check Point Endpoint Media Encryption is a great application that offers an abundance of features. This is an advanced tool so it will be perfect for system administrators in smaller or larger companies. Another tool that can help you protect your home PC from data loss or malware is USB Security. The application allows you to create a list of trusted devices and easily block all unauthorized devices. Thanks to this feature, other users won’t be able to steal your files or install malware via USB. According to developer, the application also offers centralized deployment and management so it can be used for smaller networks. In addition to blocking USB devices, this tool can also assign passwords to them, so you can access removable storage only with a correct password. Thanks to this feature, you can increase the security even further. It’s also worth mentioning that this tool runs quietly in the background, so users won’t even know that it’s running. USB Security has a built-in event log that will list all connected USB devices. The application offers password protection so nobody can make changes to its settings. USB Security is a simple tool, so it’s perfect for home users. The application is available for a free 15-day trial, but it requires a license for continued use. We have to mention that we got a warning while downloading USB Security, but after the antivirus scan it was determined that the file wasn’t malicious. If you’re looking for a simple tool that can protect your PC from data theft, you should consider this application. This tool is optimized for data theft protection, and it can prevent users from copying your files to removable storage. In addition to removable storage, you can prevent users from using Wi-Fi or wired networks, Bluetooth devices, etc. If needed, you can even prevent file upload using this tool. The application is simple to use, and after you set your master password you’ll be able to instantly lock or unlock your PC with a keyboard shortcut. You can also choose which data channels you want to lock, but for maximum security you might want to lock them all. The device also supports inactivity lock, so your PC will lock itself automatically after a specified time period. 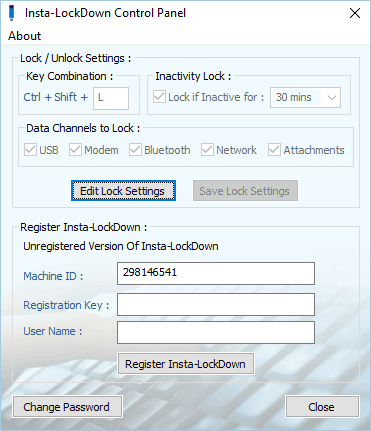 Insta-LockDown is a simple application, and it doesn’t require too much configuration. The application doesn’t offer any advanced features, so you won’t be able to set the list of trusted devices. Despite some minor flaws, this is still a solid application, and you can download it for a free trial. Protecting your computer from data theft and malware is rather important, and we covered some of the best USB control software that can help you with that. Many tools on our list are designed for business environments and professional users, but there are also couple of free tools that will be perfect for home users. Editor’s Note: This post was originally published in June 2017 and has been since revamped and updated with new products so our users would have a wider range of alternatives. We want to be sure that our list has the best products that will fit your needs.